The contents of our pages are made with most possible care. However, we take no responsibility for the correctness, completeness nor currency of the contents. As a service provider we are responsible for our own contents on these pages, pursuant to common law. However, service providers are not obliged to monitor third-party information provided or stored on our website or to search for circumstances that might indicate unlawful activities. This provision does not affect our obligations to remove or block the use of information pursuant to the general laws and regulations. A liability referring to this is only possible from the moment of actual notice of a specific infringement. We will immediately remove the corresponding contents as soon as we are notified about infringements. Our website contains links to external third party websites, on whose contents we do not have influence. For this reason, we are not able to guarantee for these external contents. The respective provider or operator of the pages is always responsible for the contents of the linked pages. The linked pages were reviewed for possible legal violations when the links were created. There were no illegal contents to be found at the time of the linkage. Permanent monitoring of the content of the linked pages is infeasible without concrete evidence of unlawful content. In the case, that corresponding infringements are known, we will immediately remove these contents. The contents and works on these sites, which have been created by the website operator, are subject to German copyright law. Third-party contributions are identified as such. The multiplication, treatment, spreading and every kind of the utilization beyond the borders of the copyright require the written agreement of the respective author or creator. Downloads and copies of these sites are permitted only for personal and not for commercial use. The operators of the site endeavour to respect the copyrights of others at all times or to use works created by themselves as well as license-free works. Where personal data (for example name, address or email addresses) is collected on our site, this is always carried out on a voluntary basis, where possible. The information and services provided can be used as far as possible without providing any personal information. We point out explicitly that data transfer over the Internet (such as communication by e-mail) can be subject to security vulnerabilities. It is not possible to completely protect data from being accessed by third parties. The use of published contact data in connection to general information requirements through third parties for the transfer of not explicitly requested advertising and information materials, is herewith explicitly disclaimed. The webmasters expressly reserve the right to take legal action in the event of unsolicited sending of promotional information, for instance through spam mails. 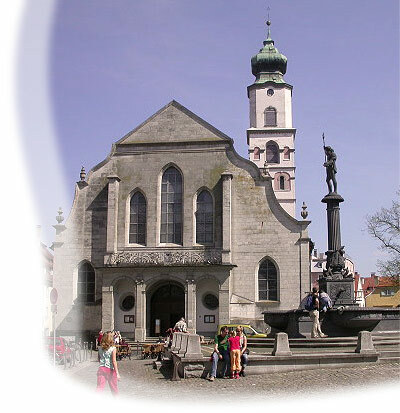 The Neptunbrunnen fountain and Stephanskirche church in Lindau.